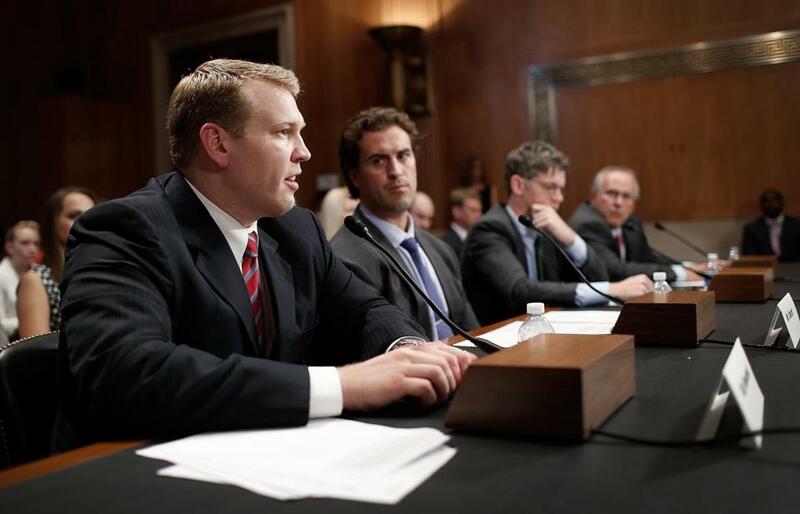 Chris Nowinski (left) acknowledges that much remains to be discovered about sports concussions. He has testified before Congress on issues concerning the brain. The pitchman at the podium, Chris Nowinski, is a former Harvard football player and professional wrestler (ring name: Chris Harvard) who believes he took too many dangerous hits to the head and decided to do something about it. Nowinski has made a career out of calling national attention to the damage wrought by traumatic brain injuries in sports. He has written a book (“Head Games: Football’s Concussion Crisis’’), co-produced a film documentary of his story, pioneered medical research by procuring the brains of deceased athletes for postmortem exams, and created the nonprofit Sports Legacy Institute to raise awareness about the life-altering threat of repeated head blows in athletics. Now, as mounting concern over head injuries has spawned a financial boom in the concussion-prevention industry, Nowinski has teamed with his mentor, Dr. Robert Cantu, to take an unusual step. They have launched a product-certification venture through their nonprofit Boston University-affiliated institute to test the efficacy of commercial sensors designed to monitor head impacts. Some specialists say the enterprise raises questions about a public nonprofit becoming a revenue-generating licensing agency; about full transparency in its testing standards; about the steep price — $25,000 a year — of certification; and about the independence of their Sports Legacy Institute as a certifying body. The institute has drawn criticism for soliciting six sensor makers to pay for its certification, or seal of approval, after seeking and accepting $25,000 sponsorship donations from each company. “Because we have relationships with companies that are involved, we are not ideally independent,’’ Nowinski acknowledged after he stood at the podium of the recent conference at the BU School of Medicine and promoted the Hit Count certification project. Sensor companies make a variety of wireless products — such as helmet accessories, skull caps, and mouth guards — that record how many hard hits an athlete absorbs. The sensors send signals to sideline personnel, who can help prevent the athlete from suffering an excessive number of head blows. Sensor makers can take their products directly to market, without the Sports Legacy Institute’s certification. But some companies desire the institute’s seal of approval because Nowinski and Cantu, who created the Sports Legacy Institute, are respected names, largely responsible for giving the concussion-prevention issue a sense of national urgency.A certification license permits sensor companies to affix the institute’s trademarked Hit Count logo to their products. The stakes are high because the sensor market is expected to mushroom as parents, schools, sports organizations, and researchers outfit athletes across the country with the devices. Sensors are expected to be widely used in the NFL by 2015. At least 10 sensors are currently on the market, and as many as 20 others are in development. The Sports Legacy Institute’s foray into licensing products is particularly unusual because Cantu recommended last year that impact sensors be certified by an independent, third-party agency. Many products, for example, are certified by ASTM International, formerly known as the American Society for Testing and Materials. Nowinski said his institute assumed the certification role because no other entity seemed poised to do so. The institute remains a nonprofit, while it enhances its bottom line with revenue from the certification program. “We don’t want to be in the long-term certification business, but the only way to accomplish a certification standard was to drive it ourselves,’’ Nowinski said. Chris Nowinski took a hit during a 2002 bout at the Springfield Civic Center. Nowinski defended the initiative as vital. By certifying the accuracy of sensors to document the prevalence of head impacts in sports, Nowinski said, he hopes to persuade athletic organizations to reduce the number of potentially damaging blows absorbed by players of all ages. Other industry specialists, including a youth sports safety advocate, lauded Nowinski’s goal. But they described his certification project as inappropriate for his nonprofit. RELATED: Should you let your child play football? Few companies have rushed to seek Hit Count certification. To date, only two sensors, the gForce Tracker and Triax headband, have received the institute’s seal of approval. The institute gave them discounts of $12,500 a year for certification because they had previously paid to sponsor the project, according to Nowinski. He said nonsponsors will pay the full $25,000 a year for certification — a price that some companies and safety advocates suggested could stifle innovation by draining badly needed research funds from small firms developing the next generation of impact sensors. The institute also charges sensor makers one-time testing fees ranging from $2,500 to $4,000. De Lench has field-tested four impact sensors with high school football players in Oklahoma and plans to test those and three others this fall with youth teams in six states. She said the institute’s annual certification fee also could “tilt the playing field in favor of established companies that can afford to pay to play. The cost of certification, however, has not deterred some companies from participating. Danny Crossman, chief executive of Impakt Protective, which makes the Shockbox sensor, has submitted his product for Hit Count testing. Crossman said he sees value in marketing a product with a Hit Count sticker and in Nowinski continuing to raise awareness about sports concussions. Others have yet to see the potential. The Arena Football League recently struck a deal with the maker of a competing sensor, the Brain Sentry monitor, to become the first professional sports association to require players to wear helmet-mounted sensors. Brain Sentry’s chief executive, Greg Merril, has rebuffed Nowinski’s requests to participate in the Hit Count program. Other companies that have rejected offers include the helmet giant Riddell, which has developed the InSite Impact Response System. The institute derives much of its income from public fund-raisers. Last year, it also received a three-year, $1.2 million gift from World Wrestling Entertainment to promote brain disease research. WWE lists Nowinski among its former superstars. In 2012, the Sports Legacy Institute raised more $1.2 million and spent more than $1.1 million, including nearly $790,000 on “reaching millions of Americans through the media to raise awareness about the dangers of concussions,’’ according to its most recently available federal tax statement. Some sensor makers, however, said the certification’s value could be diminished by the institute’s potential ethical entanglements. Nowinski himself previously served as a consultant to the company that developed another sensor, called Checklight, which one of Nowinski’s Harvard teammates helped invent. It is now marketed by Reebok. Cantu acknowledged last year that the prior relationships with Checklight “could appear to be a conflict’’ for the nonprofit, leading some to think Nowinski might unfairly support Checklight in the marketplace. Some critics also questioned the fact that the Canadian lab that Nowinski uses for his Hit Check certification previously had a contract with Reebok-CCM Hockey, which markets Checklight in Canada. It is now expired. Nowinski said the institute has managed the perceived conflicts to meet legal and ethical standards. As for Rebok, spokesman Dan Sarro said the company has a close relationship with the Sports Legacy Institute but no immediate plan to submit Checklight for Hit Count certification, partly because of questions about whether the testing standards are sufficiently comprehensive. Some sensors, like Checklight, are designed to address numerous variables in head impacts. Those variables include linear acceleration as well as rotational forces, which involve sharp turns of the head and can be particularly damaging. Yet the Hit Count project tests only linear forces, which some critics described as a shortcoming. Nowinski defended the linear standard as a way to “keep it simple’’ in the project’s initial testing. “Our goal is to add rotational [testing] in the next iteration of Hit Count,’’ he said. Blaine Hoshizaki, who directs the Canadian lab that Nowinski uses for Hit Count testing, acknowledged he did not publicly present the Hit Count standard until last month. By then, his lab already had certified two sensors. 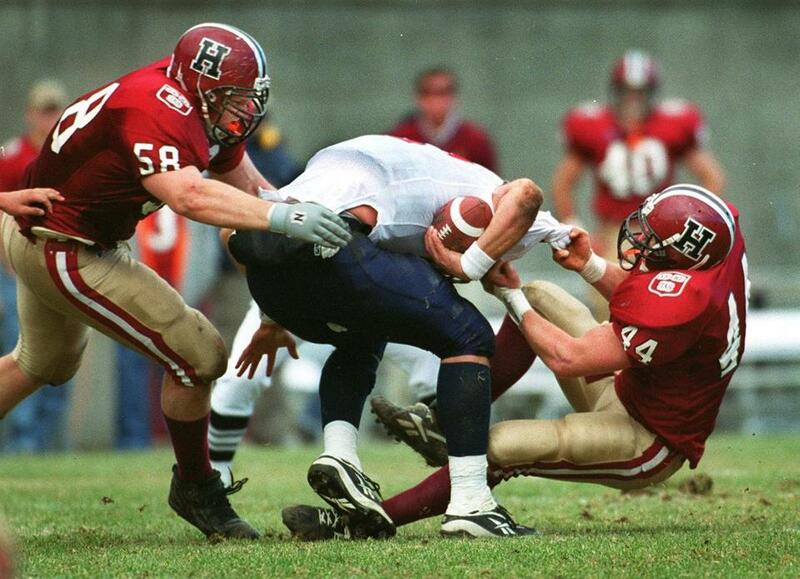 Nowinski, at left, helped sack the Pennsylvania quarterback in a game in 1999. No one has yet determined how much force causes a concussion or how many subconcussive blows contribute to brain damage. Nor does any sensor purport to be able to diagnose a concussion or the long-term effects of repeated head impacts. But preliminary studies such as de Lench’s have indicated sensors can help reduce the number of sports concussions by alerting athletes, sideline staff, and parents to potential problems. Nowinski cited a study that indicated American youth and high school football players collectively receive about 1.5 billion head impacts a year, an average of about 300 for each of the 5 million participants. No one disputes the Hit Count project’s potential to educate consumers and shape public policy. But without a greater scientific understanding of the complex relationship between head blows and brain damage, some sensor developers give little significance to the certification program. Jesse Harper, president of i1 Biometrics, paid $25,000 to become an original Hit Count sponsor. His company recently unveiled its new Vector Intelligent Mouthguard sensor, but he said he has no plans to submit the product for Hit Count certification, partly because the testing does not address rotational forces. Even Nowinski’s critics acknowledge his success in generating public concern about sports concussions. This year alone, he has campaigned from the halls of Congress to London, Boston, New York, Chicago, Colorado, Arizona, and California. Nowinski readily acknowledges that much remains to be discovered about sports concussions. But just as baseball appears to have curbed arm and shoulder injuries by restricting pitch counts, he believes, the Hit Count project will reduce brain traumas in sports. “People like counting things, and this is an important number to count,’’ Nowinski said. • Should you let your child play football?